Uglyworld #614 - Multi-Tasking (176-365), originally uploaded by www.bazpics.com. After what turned out to be a loooooong drive back to Aachen from Freiburg (projected delays on my normal road to use saw me travel through France and Luxembourg instead), so when I finally arrived home around 9pm tonight Babo greeted me at the door with "shhhh" noises. 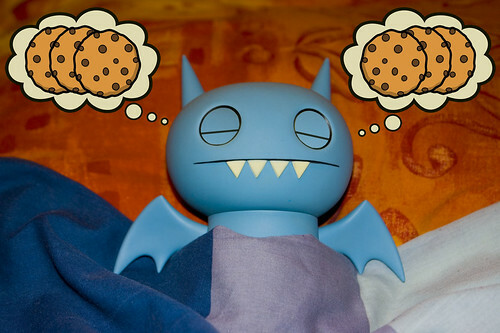 He whispered, "We musts be quiets, Icebat is sleepings alreadies! ", so I tippy-toe'd into the kitchen to make myself something to eat. While making some grub I pondered the question: What does Ice-Bat dream of....any ideas?